After the workshop on the 6 March, Professor Graeme Gooday (Leeds) will give a lecture that asks ‘Why Did Scientists Come to Write Autobiographies?’. 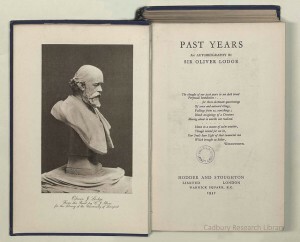 Oliver Lodge, Past Years (London: . Image from the Cadbury Research Library, University of Birmingham. The celebrity scientist publishing a best-selling autobiography is really rather a recent thing. This lecture asks what prompted scientists increasingly to publish their own life stories in the interwar period and considers what effect this has had on who we think scientists are and should be. The lecture is free and open to all. If you would like to attend, please email the project at oliverlodgenetwork@gmail.com. For further details, see the event page. You can also download the poster here (pdf).